Vtg HUGE 1978 Navajo Turquoise Sterling Pendant Brooch KENNEDY Half-Dollar! 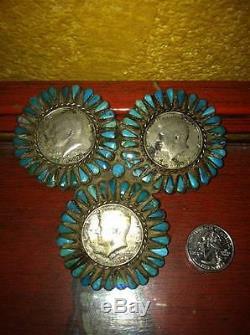 Vtg Navajo Blue/Green HUGE Pendant Brooch. 1978 John F Kennedy Half Dollars. Gorgeous stones, several different types of turquoise used, natural turquoise, heavy, heavy, heavy. Probably used for ceremonial affairs by a leader in the tribe. Not something I have ever really seen again throughout my travels all over New Mexico. The only way it can be affixed is by pinning it to your clothing but it is very heavy. I think it needs a pendant hook soldered onto the back. But the other'issue' in that the silver is soft. It would help to have some silver bar reinforcement if you would like to wear this. I have not cleaned it. It is missing a tiny stone. It is a striking piece. It still is wearable despite issues mentioned above. JFK and the Kennedy's... Which is why I bought this. Turquoise stones have great variation in color from Brilliant Blues to Greenish Blues to Robin's Egg Blues. Please look at photos closely. I think the patina looks better without cleaning. Clean carefully because it takes eons to get it to look like this. 4.25" across x 4.25" down. One does not see these anymore. Item is not refundable unless I have made an error in the listing. I strive to describe items with exactness. The item "OLD Pawn HUGE 1978 Navajo Turquoise Sterling Pendant Pin KENNEDY 1/2 Dollar RARE" is in sale since Saturday, November 22, 2014. This item is in the category "Collectibles\Cultures & Ethnicities\Native American\ US\1935-Now\Jewelry". The seller is "sonoma7940" and is located in Las Cruces, New Mexico. This item can be shipped to United States.